This design was selected as the winner in an open competition in 2010. 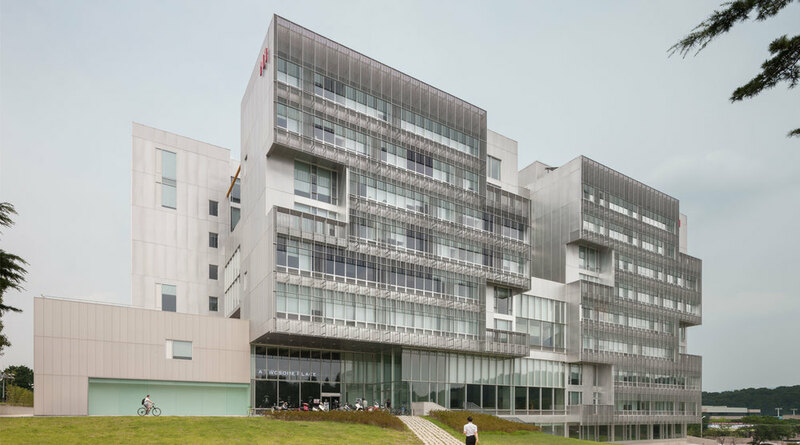 The 26,000sm interdisciplinary building is designed to bring together the fields of Computer Science, and Electronics and Electrical Engineering. The building features transparent research labs and faculty offices designed around a central core of large multi-level, indoor and outdoor social spaces that enhance cross-discipline communication between both students and professors. Numerous recesses in the overall massing express the interior space while allowing light to penetrate deep into the building; as well as provide a direct connection to the exterior in the form of green roof terraces. Three story lounges at each end and a central 9-story high glass atrium provide plenty of daylight and space for people to gather. The buildings lower levels house classrooms, a large international conference hall and a fitness center. A custom designed sunscreen louver system on the southern façade, solar panels, geothermal wells and green roofs are just a few of the building's sustainability features.